There’s lots of events coming up in Melbourne (and a few for interstaters too)! If you’d like to help organise any of them, or help out on the day, let us know! We’re always in need of assistance to stop our Committee volunteers from burning out. The more, the merrier! We would like to invite you to rejoin us in 2019! We have launched a special opportunity open only to past members, where you can rejoin at our Renewal rate of just $11 until 28 February 2019. Members like you are vital to the continued success of our non-profit club. Membership dues help support the child we sponsor through The Smith Family, as well as the costs of your annual dog tag, end-of-year member gift and associated postage. They also help cover our administrative costs (like lodging financial statements, insurance, bank fees, etc). We are proud to share that with your support, our club has donated over $77,000 to charity to date! With your continued support we hope to add significantly to this figure in 2019 as we fundraise for FareShare, Fitted for Work, Women’s Information & Referral Exchange (WIRE) and Mothers Supporting Families in Need (MSFIN). 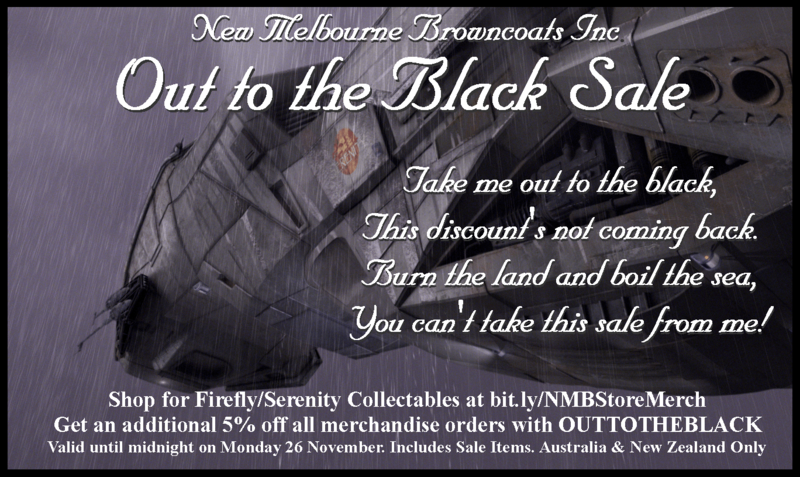 If you’d like to join us once more as a New Melbourne Browncoats Member, just send us message or email membership@newmelbournebrowncoats.com, and we will get you sorted. Once you are rejoined and paid up, your exclusive 2019 Members dog tag will be sent to you. If you need a new base set – NMB logo dog tag and chain – these can be provided for an extra $5. Thank you for your support in the past and hopefully in the future, and we look forward to seeing you either in person or online in 2019! We’ve just made our final charity donations for the year, and we’re thrilled to share that we have donated $14,227.00 in 2018! These funds were raised by your generous support of our events, Browncoat Booth, online store and memberships. This brings the total donated to charity since our incorporation in 2011 to $90,312.73!